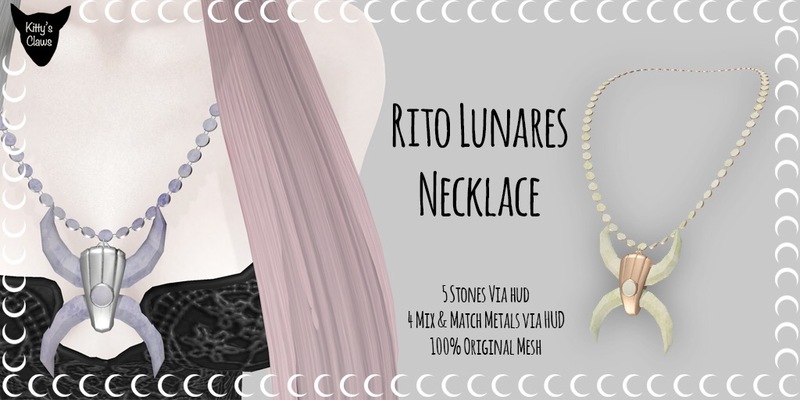 I put up my Rito Lunares necklace up on the Marketplace last night, perfect for your rituals. The stone is carved into two crescent moons with metal wrapped stone beads. It has five natural stone textures and 4 metal options via HUD and has a resize script via touch. And like all my items, it is 100% original mesh. If you are having trouble with the image drop me a line on Plurk or in-world (kittyrevolver Resident) with what viewer/browser and what operating system you are using.